The three cast-iron markers, whose epitaphs are still legible, were discovered during construction works on the grounds of the Pauline monastery in Leśniów, in a building that served as a hospital before WW2. The plaques are believed to have been located originally in the Jewish cemetery in nearby Żarki. They are currently being kept in the local cultural center in Żarki, which is housed in the former synagogue at ul. Moniuszki 2. According to the Gazeta Wyborcza newspaper, Poland’s Chief Rabbi, Michael Schudrich, has agreed to affix the cast-iron markers to the wall of the new Jewish cemetery in Żarki, on ul. Polna. If not there, may be displayed in cultural center’s museum. The town of Żarki, near Czestochowa in south-central Poland, actively promotes its Jewish history and heritage with a Jewish Culture Trail in English and Polish that is accessible on the town’s web site. The municipality and local residents in Błędów, a village near Grójec in central Poland, have begun regular work to clear the Jewish cemetery on ul. Nowy Swiat of vegetation and rubble. The cemetery was devastated during and after WW2; it served as a gravel pit, and Jewish headstones were used for constructing houses and barns and as millstones. Local citizens, backed by the municipality, formed a committee to restore and maintain the cemetery in 1996. Fragments of gravestones discovered in town were brought back there. See pictures of the cemetery here. July 6-13, Zambrów hosted 19 volunteers and a caretaker from the United States to work on the restoration of the Jewish cemetery. They also took part in workshops about the history of Podlasie Jews. The project to restore the cemetery was launched by the Foundation for the Preservation of Jewish Heritage (FODŻ) together with The Matzevah Foundation. This year, FODŻ plans to start building a fence around the cemetery, which is due to be finished next summer. A memorial wall using fragments of gravestones is planned. Already last year a group of US volunteers removed vegetation that had covered the headstones and a memorial plaque funded by The Matzevah Foundation and Michael H. Traison Fund for Poland was officially unveiled. Paris, France. 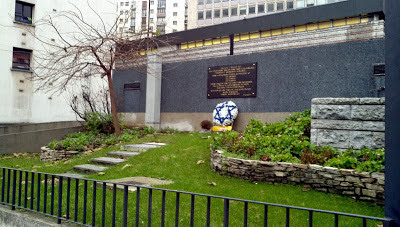 Monument to the Victims of the Deportation to the Velodrome d'Hiver by Walter Spitzer, dedicated 1994. Photo: Samuel D. Gruber 2012. Paris is a city of monuments - some better known than others. In 1993, a monument was created to commemorate the round-up of 14,000 Jews in Paris and their detainment in the Vélodrome d'Hiver an indoor velodrome (cycle track) at the corner of the boulevard de Grenelle and the rue Nélaton in the 15th arrondissement of Paris, not far from the Eiffel Tower. The deportees, many of whom were women and children, were held in the velodrome for several days before their deportation to transit camps, leading in turn to their removal to Auschwitz, and their deaths. The deportation of Paris's Jews was one of many callous acts of French collaboration in Nazi aims, which have gradually received more attention in France and abroad. Émile Hennequin, director of the Paris police, ordered on July 12, 1942 that "the operations must be effected with the maximum speed, without pointless speaking and without comment." Local police reports document that beginning at 4:00 a.m. on 16 July 1942, 13,152 Jews were arrested, of which 5,802 (44%) were women and 4,051 (31%) were children. Some people were warned by the French Resistance or hidden and escaped being rounded up. The arrested had to leave their homes quickly - they could take only a few items; blanket, sweater, shoes and two shirts. Conditions in the velodrome were horrendous, with little food and water, few toilets, and no other amenities. The deportation was remembered in Marcel Ophuls now classic documentary The Sorrow and the Pity (1969) and more recently an attempt to visually recreate the internment was made in the film Sarah's Key, released in 2010, based on the 2002 novel of the same name by Tatiana de Rosnay. The book and film stirred intentional interest in the history of the round-up and the fate of French Jews, and I suppose led to my own visit to the memorials last when in Paris December. In 1959, a fire destroyed part of the Vélodrome d'Hiver, and the rest was demolished. A block of flats and a building belonging to the Ministry of the Interior now stand on the site. Since then, a series of markers have been installed in the area to remember the deportation and commemorate the victims. 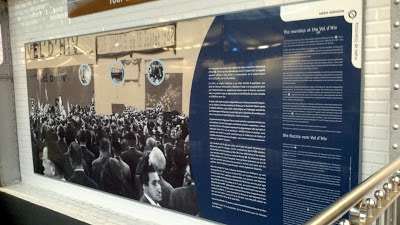 In 1959, a recent plaque that was placed on the track building was moved to new structure at 8 boulevard de Grenelle. 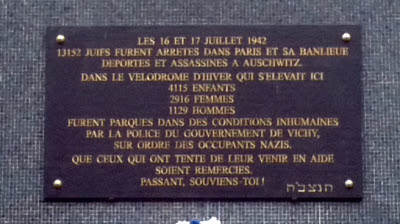 This commemorative plaque, seen below, facing the Bir-Hakeim métro station, mentioned for the first time the numbers and fate of Jews who were held inside the Vélodrome d'Hiver. On 3 February 1993, the President, François Mitterrand, commissioned a monument to be erected on the edge of the quai de Grenelle. Near where the Velodrome d'HIV stood. Polish-born Holocaust survivor Walter Spitzer was engaged as the sculptor and Mario Azagury the architect. This is added a Holocaust-themed sculptural work to the already rich commemorative landscape of Paris that includes scores of figural sculptures recalling people, places and events of the past. Paris, France. Monument to the Victims of the Deportation to the Velodrome d'Hiver by Walter Spitzer, dedicated 1994. Photos: Samuel D. Gruber 2012. 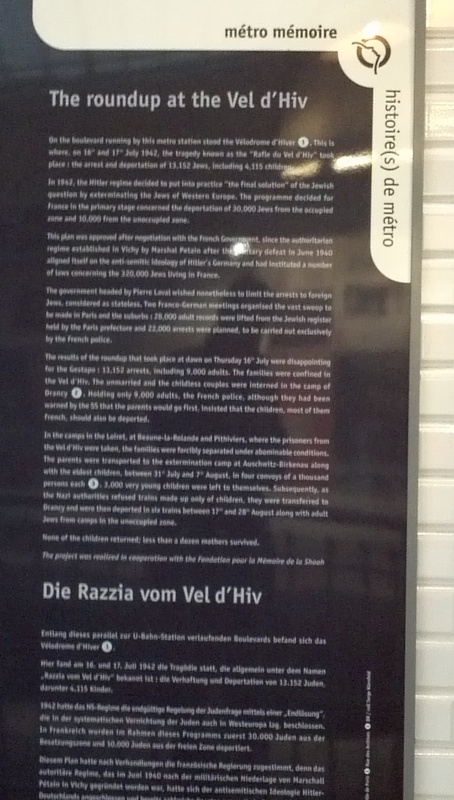 The Paris statue refers to all deportees but especially commemorates the victims of the Vel' d'Hiv. The figural sculptural group emphasizes children, and includes a pregnant woman and a sick man. The curved concrete shell on which the bronze group sits is meant to represent the curve of the velodrome track. In fact, deportees were in the stands and the throughout the entire complex, but there is no contemporary visual documentation of the scene. Paris, France. Monument to the Victims of the Deportation to the Velodrome d'Hiver by Walter Spitzer, dedicated 1994. Commemorative inscription. Photos: Samuel D. Gruber 2012. The words on the monument are: "The French Republic in homage to victims of racist and antisemitic persecutions and of crimes against humanity committed under the authority of the so-called 'Government of the State of France.'" The monument was dedicated on 17 July 1994, and since then a ceremony is held at the site every year. At the ceremony in 1995 then-president Jacques Chirac, successor to François Mitterrand, spoke about the guilt of the French police and gendarmerie who collaborating with the Germans in the deportation. The monument is on land given by the city of Paris and paid for by the Ministère des Anciens Combattants (Veterans Administration [Am], Old Soldiers [Br]) and is cared for by the Ministry of Defense. In the tradition of many artist-survivors who in their art have chosen to bear witness through narrative or expressive realism, Spitzer created a tableaux of realistic figures with whom the viewer can identify and perhaps empathize. This is not a new strategy. Rodin did something of the sort in his great monument The Burghers of Calais (visible a short walk away at the Rodin Museum). But while Rodin depicted anxiety and suffering through dramatic and even exaggerated gesture and facial expression, Spitzer prefers a quieter style in which the figures expressions are introspective, and their gestures turn inward as group embraces. The feeling is one of calm - either from uncertainty or expectation. These figures - unlike those of Rodin - face their martyrdom (anticipated at least by the viewer) with stoicism and familial love. Parsi, France, The Burghers of Calais (1894-95) by Auguste Rodin, Rodin museum. Photo: Samuel D. Gruber 2013. Spitzer's work also responds to the commemorative monuments by sculptor Nathan Rapoport, especially the iconic Warsaw Ghetto Uprising monument that has been the center of Holocaust commemoration in Poland since 1948, something reiterated this year at the commemoration of the 70th anniversary of the Warsaw Ghetto Uprising. like, Rodin, Rapoport was inspired by Michelangelo, and his great bronze figures are like Rodin's, actively posed, albeit more heroically. On the rear of the monument Rapoport has depicted the deportation of victims. These figures, while also active, have in their desolation more in common with Spitzer's victims of the Velodrome d'HIV. Warsaw, Poland. 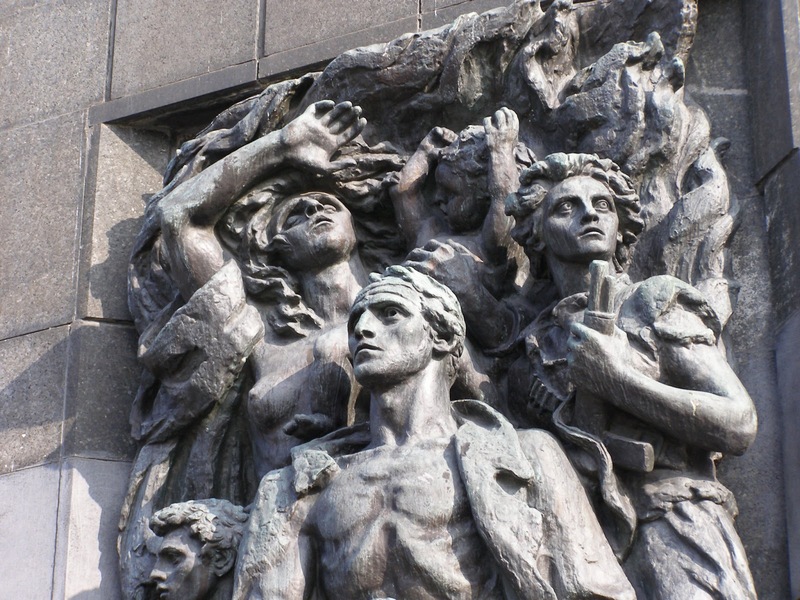 Warsaw Ghetto Uprising Monument by Nathan Rapoport. Front. Photo: Samuel D. Gruber (2008). Warsaw, Poland. Warsaw Ghetto Uprising Monument by Nathan Rapoport. Rear. Photo: Samuel D. Gruber (2013). For a very different commemorative approach, also much influenced by Rodin (but more his Gates of Hell) see Kenneth Treister's giant Holocaust Memorial of the Greater Miami Jewish Federation, dedicated in 1990. While the Paris sculpture specifically references the events at the Velodrome, its form of a huddled mass of suffering people, including women and children, fits in with a series of other recent monuments to suffering, that have attempted to represent and humanize victims (as opposed to representing them either through abstract symbols or overly-expressive and distorted forms). I'm thinking especially of the Irish Famine memorial in Boston by Robert Shure, dedicated in 1998, and the Kindertransport monument in outside of Liverpool St. Station in London, created by sculptor and child survivor Frank Meisler in 2006. These children, of course, are the lucky ones – and they wait patiently like The Railway Children, for their English saviors. Another version is outside the train station in Gdansk, Poland. A different version by the same sculptor is outside the Friedrichstrasse Railway Station in Berlin. In 2008 more a more descriptive and informative narrative placed at the nearby Bir-Hakeim station of the Paris Métro. See more photos of the markers and monuments here.